What’s the first thing you do after booking a holiday? Check the weather? Look at the local area? Google what the beaches are like maybe? Mine is to find the best restaurants I can, which then leads to me saving them on my Google app, so I know exactly how far away they are from where I’m staying. I found some absolutely gems in Cyprus so decided a full-on Protaras Restaurant Guide was needed. Food makes the holiday, right? For my recent holiday in Cyprus this wasn’t so easy. Not for the lack of restaurants, in fact quite the opposite! There are so many. AND, I was also aware that plenty of them had the potential to be awful too. People in Cyprus are very passionate and serious about their food, but that doesn’t always mean you’ll like it all! I’m also determined to prove that there’s far more to Cyprus than the party reputation that Ayia Napa has labelled it with for past 15 years or so. If you read my previous Cyprus blog post you’ll also know that I’ve done the whole party thing a long time ago, and on this visit actually wanted to remember where Ayia Napa actually is, and not just have a mish-mashed memory of fishbowl cocktails and free shots in every bar you walk past. Plus, the party goers make up only a small percentage of Cyprus’s visitors and most of them sleep through the day right? Staying in a villa, which I always love, makes it a lot easier in the day time with regards to meals and snacking. Doing a big food shop at a local traditional market is something I get very excited about, and cooking in a fab kitchen even more so! But for an evening meal out, watching the sunset, with good company, a decent glass of wine and a gentle sea-breeze is just heavenly. It takes some beating with regards to what I love most about going on holiday. My son Coby and I were the first to arrive, so until the others made an appearance we decided to go for a wander near our villa for something to eat. We possibly chose the worst restaurant we could have. I’m not even going to tell you the name as I don’t want to endure that meal on anyone. I blame being tired, hot (still adjusting to the temperature) and being far too ravenous to choose sensibly. The second night was my little sisters birthday (yes Jenna, I finally admitted, in public, you’re the younger one) and we had to find somewhere that little bit more special. It was an improvement on the previous night, but still doesn’t deserve a mention as it wasn’t that great either and the service was just a bit weird. However, the fourth night was where it all started to get a little bit better. Also, conveniently, it was my birthday. I’ve learnt that the trick to getting good restaurant or bar recommendations is to speak to the locals. I made friends with our taxi driver, Pedro, who I met on the journey from the airport to our villa. Knowing where we were staying was in a random location which would be hard to describe, he gave us a business card and said to call if we needed a taxi. He was super friendly, in a good way, and he chatted away about his children living in London and how he’d heard about the mad heat wave we were currently having. It was a win-win situation really. He got our custom, we got his advice and local knowledge… as well as a taxi ride! This is his number by the way, +357 99 451852, just in case you go to Cyprus and need a taxi! We’d avoided the centre of Protaras so far, but Pedro had told us that there’s a restaurant smack back in the middle of it which was traditional, really good quality and family-run. So, we hopped out of his car and trusted his word. I also had a quick scan on Trip Advisor, because the fear of eating a bad meal is always strong, and I can’t resist a quick check. With a 4.5 rating and excellent reviews I was beginning to feel really excited and my mouth was literally watering at the thought of food! Running since the early 90’s Andama boasts popular dishes starting from classical salads and carpaccio’s to steaks, pasta and seafood. A tribute to the traditional style of Greek – Cypriot cuisine from old times, there are tables outside where you can people watch (a favourite hobby of mine) with a view over the sparkling turquoise sea, or you can sit inside if you prefer. Not sure why you’d want to do that in such beautiful surroundings, but you never know. We were seated at a lovely big table and my sister quickly noticed the menu had a fun little Greek language section on the side, and the waiters encouraged us to say some of the words which was really funny! It started the meal off on a fun note and we were immediately seeking out the cocktails! For my starter I had Kolokithokeftedes… roasted courgette fritters which were super fresh, wonderfully flavoured and made using local produce. I don’t think I’ve ever enjoyed something courgette based so much. They were a really generous portion too and I know I’m going to be craving them for some time! Would it be totally wrong to go back to Cyprus just for these? For my main I had Ravioles which was a traditional stuffed ravioli with grated Halloumi and in a garlic sauce. Cooked to perfection, hot and extremely moreish, my birthday meal was proving to be a success! For a restaurant in the middle of lots of bad restaurants it would be easy to skip past if you were wandering past starving, but if you are looking for somewhere on the main strip you really couldn’t go wrong here. My Mum had the meatballs, my brother a huge fish meze, my son a giant burger. Each one complimented their food and I didn’t hear one negative remark. Top service, friendly and fun atmosphere, amazing food… could you ask for anything more? One morning my brother and me went on a little road trip. No sat-nav on the go, just good old intuition and road-signs to guide us on our way. We stopped off for a swim, some sightseeing then felt a little peckish, so I spotted a little beach cafe at Clyki Nero Beach, swung the car in the car park, ignored the confusing massage signs and chose a table on the corner with a sea view that made us want to chill there all day. With its white-washed walls and blue-checked tablecloths its easy to see why lots of hungry locals come here. No website, no Facebook page… it doesn’t need it and it probably doesn’t care either. We ordered a little meze of dishes, Tzatziki being my particularly favourite dip, and everything came with a huge bowl of fresh warm home-made pitta. When in Cyprus it would be a crime not to sample bowls of hummus and tzatziki at the traditional tavernas so take advantage when you can, and eat as much as you can! Plastic chairs and plastic tables are part of the decor, but don’t let that put you off, it’s a beach bar remember…. the food and the view is what we came for. Fresh juices and a fruit platter arrived and we both sat with our feet up, silent, with the odd appreciate food noise slipping out, but both totally in our element. Nava Beach Club was actually a totally random find when I was driving past one day and really liked the decor and the look. Sleek and incredibly hip, this place situated in the Pernera area of Protaras has only recently opened, and is the epitome of all things cool with rustic furniture, industrial lighting and a cave-like setting. Elements that combine a seafront setting and modern (slightly expensive) food into one effortlessly cool experience. Nava means beautiful in Hebrew and it’s very fitting. We went back without the kids later that night, bar Coby who can be mature when he tries, and ordered up a feast. I’d eaten so much Cypriot/Greek food on this holiday and I’d filled myself with fresh fruit for lunch so when I spotted vegetarian sushi on the menu I dismissed the little voice in my head trying to stop me being so ‘non-traditional’ and went for it. No regrets whatsoever. It was delicious. My Mum had a huge portion of Fish and Chips which arrived much prettier than the UK version. Fried cod, served with coleslaw salad, pea puree, salmon roe and fresh Cypriot potatoes. My brother went for the humongous Seafood Pappardelle which was overflowing with fresh mussels, calamari, prawns and tuna in a rich but simple tomato sauce. Coby surprised me by ordering fruit… each to their own! Modern dishes that capture the flavours of the season which are also perfect for sharing. Their moto is Eat. Drink. Party… I imagine the latter is also lots of fun. Nissi Beach is really pretty… when there’s no people on it! Sorry if you’re a fan and disagree! Same goes for Fig Tree Bay too. For me the perfect beach day is chilled and easy and whilst I don’t mind a bit of music I do mind full on partying and hate it when the sun loungers are so close together you can’t turn over without elbowing someone… I guess I’m just a tad boring in this regard, but I seriously don’t care! Maybe if I was with friends I’d feel differently. But for now, I know what I like… and I know what my Mum likes too. We pulled up to Fig Tree Bay, took once glance, and left again. Drove a little further up the road with the intention of finding somewhere to turn around and head in the opposite direction when we came across the Salty Fig. A tad quieter with just the right amount of people to make you want to enter, and the right atmosphere and buzz to persuade you that little bit more. Comfy seats at the front for those that want to sip a cocktail under the fig trees with a view of the bay, large tables for parties and groups with a few other comfy chairs dotted around. Music playing at just the right volume and shady areas to escape the sun and eat in comfort. We took our seats and were handed a menu where half the dishes were unavailable… not a good start! But then the waitress started to explain what was available with such knowledge and genuine enthusiasm about the dishes she won us over easily and we stayed. Plus, Coby spotted an ‘ice-cold chocolate’ drink on the menu, ordered it within lightning speed and that was that. I ate a Dakos salad, possibly one of the most iconic Greek dishes there is, but also one of the simplest to make. With a side order of fresh hummus and pitta my lunch was off to a good start. Coby ordered a chicken wrap, and both my Mum and brother went for salads too. I loved you could also get an ice-cold coffee made with coconut milk so took advantage and had two! Service was slow, and there was an element of that ‘Wagamama’ weird thing where dishes arrive as and when they’re ready, rather than together in courses. But it was no big deal, we were in no rush and the food was worth the wait. If you go to Cyprus and try one of these places, let me know. Or have you already been? Do you love food on holiday as much as me? 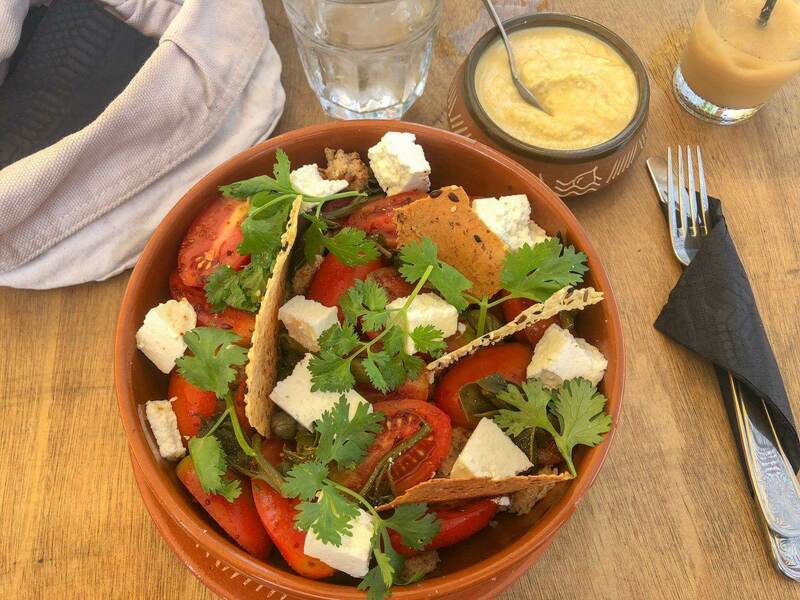 One thing is definite, do not leave the island without tasting the Cypriot meze. "(AD) Coffee & Cake with TASSIMO"
Ahh I know what you mean! It’s perfect chill out food. Is always great to do some research on good eateries before visiting somewhere. When you have limited time in a place, it’s really disappointing to have rubbish meals!